Fifty years after the first ever spacewalk by Soviet cosmonaut Aleksey Leonov, despite huge progress it’s still dangerous and difficult work, astronaut Paolo Nespoli told RT. He recalls his mission to the ISS and explains why even a small step matters. RT:Paolo, in less than a week it will be the 50th anniversary of the first spacewalk performed by Soviet cosmonaut Alexey Leonov. How big of a breakthrough was this back then? 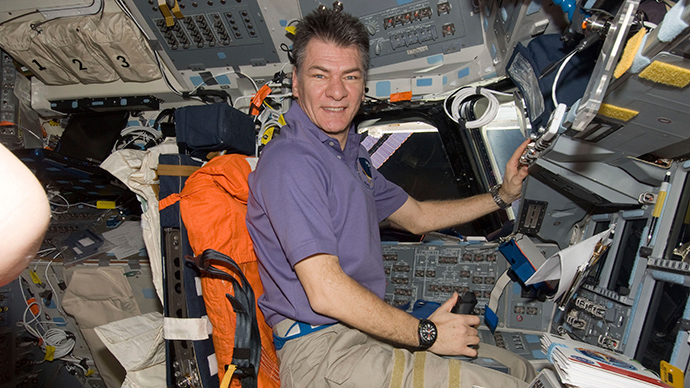 Paolo Nespoli: It was pretty much a big deal. When you are in space, you are actually in a spacecraft which keeps you alive. The environment there is pretty brutal and will kill you in less than a second if you’re there just as you are. And going out of a spacecraft would mean to go out to this womb. What Leonov did 50 years ago was a really remarkable thing. RT:Especially when no one has done it before and the technology was not as good as it is today. PN: Whenever you do for the first time in these kind of conditions, it’s always amazing. In fact, if the story has been told to us right, he even had some kind of trouble getting back into the spacecraft, he had to do something a little bit daring – let some air out of his spacesuit, which sounds really scary even today for anybody who’s been trained for a spacewalk. RT:Are spacewalks these days just a matter of routine or each one is a personal breakthrough in its own way? Because each time there is still a potential danger, isn’t there? PN: I would take a person who has called a spacewalk ‘just a walk in space’, put a suit which weighs more than a hundred kilos on him or her, put him or her in a place where you basically can’t walk, and then say: “Ok, now do a spacewalk!”A spacewalk today is a brutal activity which takes a minimum of six to seven, or even almost 9 hours grueling activity, when you are performing a series of steps, very delicate moves. You cannot mix them up and you are always in danger. You are working in an environment which is unforgiving. You can always get in the way of space debris, or get detached from the spacecraft and when you cannot come back any more, you can cut your suit and lose your air. In fact, an Italian astronaut just a year and a half ago, had a pretty serious emergency during his spacewalk and he had to cut short his walk. He barely made it back. RT:Did you have any experience yourself out there? PN: I was not one of the fortunate guys, who was able to go out for a spacewalk. I had to stay inside. I’ve been trained and I’ve done all the activities in space, but I never did a spacewalk. Actually one of the reasons why I have never made a spacewalk is because the space station never had any problem while I was up there for six months. I was trained and my suit was ready, but everything went normally when I did my space flights. RT:What is it like up there? It’s easy enough for us to look at it, but it’s such a detached experience down here, looking at pictures from up there? PN: We go up there for working. Your day is pretty much scheduled from 7:30 in the morning until 8:30 in the evening. The control centers on the ground, in Houston, Moscow or Munich, Tsukuba – they really try to cram as much into this working schedule as possible, trying to make sure that all their resources are available, so that six people can work in this confined and small environment. There is no much time to enjoy it, in a certain way. RT:And not much time to worry, I guess? Even at the back of your mind you haven’t got an idea that something could go wrong any moment. You don’t have time to do that. You get to go on with the job, which you are allocated to do, yes? PN: You are conscious of the fact that you are actually doing pretty important work out there. It dawned on me several times that I was having in my hands an experiment that took 200 people five years to build and cost a million dollars and here I am, the experiment, the procedure and an hour and a half to perform it. And I know if I mess up something, if I don’t do things the way they are supposed to be done, I could break it and then it’s gone. So there is a sense of responsibility there, there is a sense of you doing something important and you try to concentrate as much as possible. But when the time is up in the evening for example, I used not to go to sleep when I was supposed to. I would take an hour or an hour and a half to go to our huge windows that we have on the station – it is called a cupola – and was just looking at the magnificent Earth that is strolling under me at eight kilometers per second and I can assure you, it’s an amazing view. RT:You’ve spent a lot of time in space. Were you sad to come back down in the end of the day? PN: Yes and no. It’s a unique opportunity: You really experience something different. You really become something different, an extraterrestrial person, I would say. Gravity is no longer a factor; you look at things you can’t see from Earth. It’s pretty special but it is also kind of tiring. I think six months is a good amount of time [to be happy] to come back, enjoy gravity again, smells, senses, seeing people, just go around for a stroll, listen to music and enjoy the sun. RT:Of course, and the latest plan to send somebody out for 12 months, that’s going to be pretty hard work for a person going up doing that, is not it? PN: Scott Kelly is the American astronaut who will go to space on this mission. He, actually, was my commander during four months of my six month stay on the station. I think today one year sounds like a pretty long time, but if we look at how much it would take to go to Mars, for example, we need several years to find out how the body will reacts to being in this environment of microgravity for such a long time. Today it seems long. But think about 1400-1500 when people would leave and go to India and then end up in the United States of America. They did not know if they would ever come back, and most of them did not come back. This is a real exploration. Exploration does not mean buying a round trip ticket. It means going somewhere where nobody has ever been. In the beginning it looks impossible, difficult, incredible, and then bit by bit it becomes normal and natural. I think this is what will happen in the future. I hope my children will have a possibility to buy a ticket and go for a week of vacation on a space station. Why not?